REWARD - You’ll have to go there to see it. On Tuesday, December 6, the Madison City Council will act on the recommendation of the Alcohol License Review Committee (ALRC) to approve a Class A Liquor and Beer License for the former Zimmer's Liquors at 4217 West Beltline Highway. The Council could decide to approve the license with all the conditions recommended by the ALRC, or it could vote to approve the license but lift some or all of the recommended restrictions. [See the article below to learn about the recommended conditions.] The City Council also has the power to deny the license entirely, but according to staff in the City Clerk's office, the Council usually goes along with what the ALRC recommends. The new liquor store owner has stated that she plans to ask to have some of the conditions lifted. The Alcohol License Review Committee recommended giving the license to the new owner of Zimmer's at 4217 West Beltline on Wednesday, November 16. However, it put many conditions on the license. The conditions include indoor and outdoor video surveillance, motion lights all around, no sale of 50 mL, 100 mL, or 200 mL hard liquor, no sale of single bottles or cans of beer or similar beverages except for microbrewery beer that comes in no other way, and meetings once every 3 months with the Dunn's Marsh Neighborhood Association. There might have been other details I missed. When all liquor licenses come up for renewal in May, this license will get special attention from the ALRC, and I believe neighbors will have the chance to speak out on how things are going. The ALRC meeting ran from 5:30 pm-11:30 pm. This item came up at 9:25 pm. Neighbors who spoke actually waited for more than 4 hours. Originally, 9 neighbors came, and 5 stayed to speak. This item took about 2 hours from start to finish. Looking for 2 hours of entertainment? J Well, maybe not entertainment, but definitely reality, if not a reality show. It’s the video recording of the Alcohol License Review Committee’s hearing about the application for a Class A Liquor and Beer License for 4217 West Beltline, the former Zimmer’s Liquors. The entire proceedings on November 16 at the ALRC ran 6 hours. The hearing about 4217 West Beltline ran 2 hours and 2 minutes. The Internet address is listed at the end of this article. The motion recommending granting the license was made about 5:49:45 (about 5 hours and 49 minutes into the hearing). the November 16 ALRC meeting. It was a long night at the Alcohol License Review Committee (ALRC) November 16, but a group of neighbors stuck it out for 6 hours to have their say about licensing the the liquor store at 4217 West Beltline and hear what the ALRC members would decide. Some of them had written to the ALRC prior to the meeting as well. Except for the applicant, all the neighborhood speakers came out against granting a license for the new owner of the establishment, formerly Zimmer’s Liquors. First to speak was Paul Rogovich. He said he is always super cautious when passing 4217 West Beltline because vehicles tend to careen out of the liquor store parking lot. This kind of aggressive driving is not true of neighboring businesses on the frontage road. Paul is an Arboretum steward. 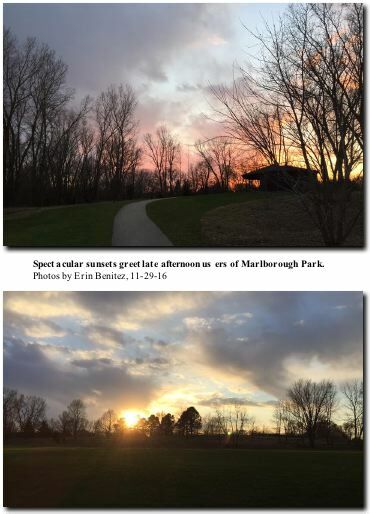 He mentioned that while some customers use the frontage road to get to their apartments down the road to the east, others use the the paths in the Arboretum as an alternate route. As a steward, he picks up after them - mostly flask-sized bottles and beer containers. Would a change in management change that litter problem? He thought not: “The problem is intrinsic to having a liquor store,” he said. He concluded that denying a liquor license “would be an opportunity to free the neighborhood” of all the problems associated with a liquor store. He also handed in petitions signed by 57 neighbors opposing a liquor license. Next, his wife Dale-Harriet Rogovich spoke. Her main point was that Danbury Street has a school bus stop, and she does not want elementary school kids exposed to the inebriated customers who have passed out in yards on or near Danbury. 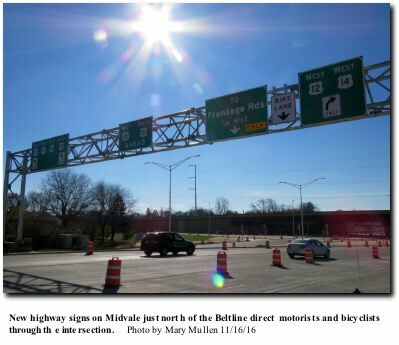 Mary Mullen had recently picked up recyclables along the Beltline and Verona frontage roads. She displayed 2 large garbage bags filled with the alcohol containers. The majority of containers were the small 50 mL “airplane bottles” although containers of all sizes were represented. She said she had only recently learned that liquor store customers were getting drunk to the point to falling unconscious nearby and that an open-air drug market was apparently in full swing among liquor store customers who overflowed into the NAMI parking lot next door to the store. Mary noted that the applicant had not contacted the neighborhood association as required as part of the license application. Sam Shesman, a new resident on Danbury since May, said he thought it was amusing the first time his 2-year-old daughter brought in a liquor bottle she had picked up in the yard, but it is no longer funny. Now his first act every morning is ridding his property of alcohol containers. Twice, drunk customers have passed out in his yard. He said he felt there were a lot of alcoholics living in the neighborhood and that proximity to the liquor store enables them. “The liquor store is a hub of the problems,” he said. As one of the neighbors who passed a petition against the license, he pointed out that signatures were easy to get. The last neighborhood speaker was Julianne Carbin, Executive Director of the National Association for the Mentally Ill (NAMI), the business located just to the west of the liquor store. She told of how liquor store customers often park in the NAMI lot and apparently conduct their illegal drug transactions there. She has seen wads of money exchanging hands and people shooting heroin. She and other employees have to be very careful when leaving work because of these issues. Mark and Krisann Miehe of Midwest Financial Service at the corner of Seminole Highway and the frontage road could not stay, but their communications with the ALRC noted that people cut through their parking lot to get to the store - the parking lot has driveways opening on Seminole and the frontage road - and they had to pick up alcohol containers discarded on their property. Likewise, Crystal Hester, a NAMI employe had to leave prior to the hearing. She would have corroborated Juliane Carbin’s statements. The other neighborhood resident attending the hearing and opposed to the license was Patty Stockdale who preferred to listen. Fitchburg Alder Dorothy Krause had another meeting, but she left her statement to be read to the ALRC. She was in favor of granting the license if the DMNA requests were met. The argument for granting the liquor license so the store at 4217 West Beltline could continue to operate was presented by the new owner, Gurpreet Ghuman, her lawyers, and by Wanda Smith, a neighborhood organizer who has worked with the Jamestown neighborhood and was in support of small business owners. Mrs. Ghuman spoke before other registered speakers were called, and the ALRC asked questions before going on to the rest of the hearing. A lengthy discussion followed during which Alder Verveer, an influential member of the ALRC, asked her if she was aware that airplane bottles are illegal in the downtown campus area. Eventually, the motion passed by ALRC recommended adding all the restrictions imposed on downtown liquor stores. These include no sales of 50 mL, 100 mL, and 200 mL liquor bottles and no sales of single-serving beer or ale containers. During the long wait for the hearing to begin, neighbors had spent some time in the hall discussing the problems associated with Zimmer’s. Mr. Petri, one of Mrs. Ghuman’s lawyers, had been part of this discussion. On the hearing stand he said that the hall time was good, that good information was shared. He said that Zimmer’s had been in operation since 1970, but that Zimmer was “behind the times.” Zimmer’s had no security measures. Petri said the liquor store owners could agree to meet every 3 months with the nextdoor business, NAMI. He said a big difference would be that the Ghumans would own the building whereas Mr. Zimmer only owned his business. Thus the new owners would have more of a stake in the neighborhood. The second lawyer, Jay Smith, said that the conditions suggested by the DMNA were all reasonable. After that, the neighbors were called on to speak, and the ALRC members also asked them questions. All opposed granting the license. Following them, Wanda Smith was called on. She described herself as “a community organizer in favor of the minority business owner.” She mentioned working with the Jamestown community. Ms Smith said she had met with the applicant’s husband, and they were “trying to get the community together” and “to bridge the gap.” She reported that he would “sponsor stuff for neighbors and kids.” People would “see a positive role model.” She said that Peace Network would partner with him. According to the Internet, Wanda McCann-Smith is the registered agent for Peace Network Inc, and on LinkedIn she describes herself as a mental health specialist. Most of the rest of the meeting was devoted to discussion among the ALRC members. Mike Verveer, Michael Donnelly, Fernanco Cano Ospina, and Stefan Fletcher were the most frequent members to talk; two alders on the Committee had to leave for other meetings before this hearing came up. ALRC members did their best to explain that they were not singling her out, but were trying to balance the needs of the neighbors and the needs of her business. Alder Verveer noted that she could come in to apply for a change in conditions any month. Alder Maurice Cheeks, who had earlier ceded his chance to talk, then said a few words. He said he felt it wasn’t necessary to present the DMNA requests since it was clear that the ALRC was well aware of them. He asked about the prevalence of restrictions such as those recommended for 4217 West Beltline and further suggested that the ALRC should be striving to understand unintended effects of their decisions on minorities and poor people. He did not actually come out for or against the license or its conditions. As things wound down for the evening, Thomas Landgraf, chair of the ALRC, noted that the owner could object to the ALRC-recommended conditions at the December 6 City Council meeting. At the store a few days later, Mrs. Ghuman stated that she would be protesting the conditions that the ALRC recommended. While a July e-News article suggested that the Little Free Library (LFL) would be moved from its Danbury/Lumley location to below Crescent Road, it wasn’t until this November 21 that Fitchburg actually gave its official approval to allow placement of the LFL there. 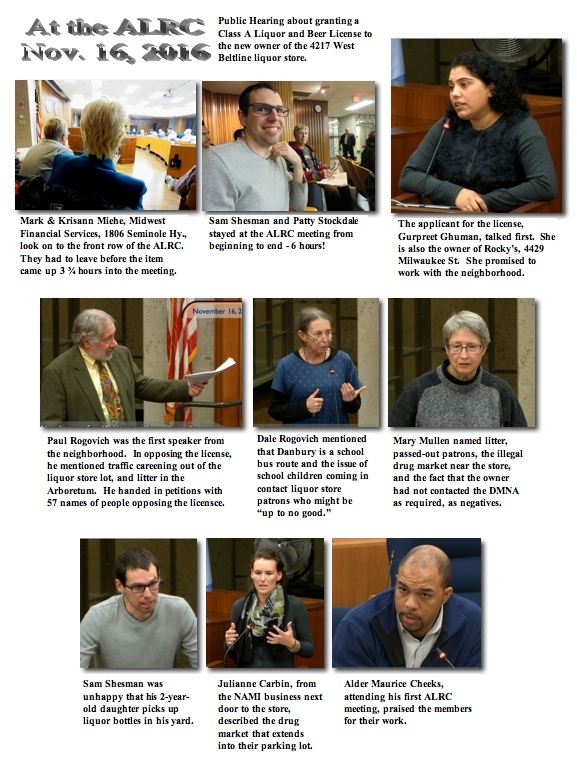 On that Monday night, 2 DMNA Council members visited the Fitchburg Board of Public Works to advocate for the Board’s permission to relocate the LFL to public land down near Apache Pond. They were Elvice McAlpine, who did all of the legwork with Fitchburg on this issue and who will sponsor the LFL, and Mary Mullen, former DMNA president. The Board devoted a fair amount of discussion to the request. Apparently, this LFL would be the only one where permission was asked to locate one on public property in Fitchburg. There may be some in street right-of-ways that were put up by homeowners. The discussion focused on whether granting permission would set a precedent and what liability the City might be accepting. One Board member wanted to delay setting of the LFL until the city attorney was consulted and a policy was written, but in the end, it was decided that the City should go ahead and give permission right now. One Board member then requested that a short policy should be written about privately-owned facilities on public property. He suggested a 1-page policy, “actually 1 paragraph.” Don’t say that there’s no humor in government. The City will decide on a good location, get the utilities marked, and actually dig the hole for the post. Meanwhile Elvice and her husband Tom are working at getting the LFL removed from its present location. A few weeks ago, I was out on the street when Bus 19 appeared from the gloom, its electronic sign shining brightly above the windshield. As I glanced in its direction, I was shocked to see “Dunn’s Marsh” come up as one of the destinations. Just last night I got my answer when I saw the 19 down on the Monroe Street. The answer is that the sign flashes “Dunn’s Marsh” far distant from our neighborhood. Does anyone know how long we’ve been a named destination on this bus and whether Bus 18 also flashes our name? 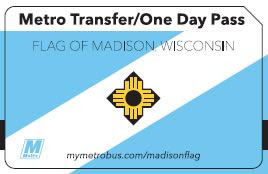 To give background and attention to the official flag of Madison, Metro Transit will be proudly displaying its image on 31-day passes and transfers starting this winter. The flag was designed by current Metro Transit driver Dennis Stone when he was a member of the Madison Drum and Bugle Corps. · The City of Madison adopted the design as its official flag on April 12, 1962. · The flag consists of a light blue bacground bisected from lower left to upper right by a white band. This symbolizes Lake Mendota and Lake Monona and the isthmus between them. · In the center of the flag is a black cross, which symbolizes the four lakes (Mendota, Monona, Wingra, and Waubesa), as well as the cross shape of the Wisconsin State Capitol. · Overlaid on the cross is a Native American sun symbol, called the ZIA, which is similar to the sun symbols on the state flag of New Mexico, and the municipal flags of Wichita, Kansis and Albuquerque, New Mexico.